There will never be another James Dean. This is sort of a companion piece to last week’s “Back to 1955” in which we looked at Blackboard Jungle and how it both succeeded and failed to portray the restlessness of mid-fifties American youth. That movie portrayed its troubled teenagers as angry and dangerous, but seemed to have little interest in understanding why they were so restless and upset in the first place. Blackboard Jungle is a story told from the point of view of an authority figure on a mission. Rebel Without a Cause takes the opposite approach and puts these teenagers and their angst in clear focus. It’s a character movie that’s acted, directed, and shot with incredible skill. I think it’s a masterpiece. But here’s where things get tricky. 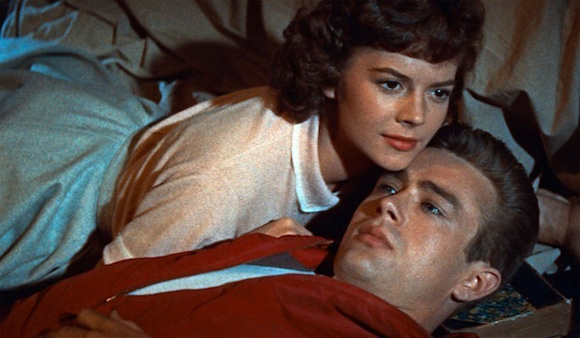 In order to truly analyze 1955’s Rebel Without a Cause, we must descend into the dark world of forbidden Hollywood, where whispered rumors swirl and tragedy abounds. This movie has roots in the seedy Hollywood that I’m both drawn to and repelled from. I’m torn: on one hand, I don’t really want to dwell on speculation and gossip, but I realize that seediness and sadness are so much a part of the legacy of this movie that it’s unavoidable to proceed without at least a cursory examination. It’s a fact that the lives of so many people involved in this movie, both in front of and behind the camera, are surrounded by heartache and tragedy, which I believe influenced the finished product. Let’s start with the acknowledgment that the three main stars of this film, James Dean, Natalie Wood, and Sal Mineo, all died tragically at far too young of an age. James Dean’s violent death in a car crash three weeks prior to the release of this movie made him an instant icon, with audiences forever wondering what might have been. Natalie Wood, on the other hand, lived such a tragic life for so long that I can’t watch her films anymore without being sad. It’s now accepted as fact that she got her role in Rebel Without a Cause by becoming romantically entangled with her director, 44-year-old Nicholas Ray. Ray was no stranger to despair either, having seen his father die after a night of alcoholic misadventure when Nicholas was only a boy. Plus, at the time he directed this film, Ray had recently stumbled upon his wife in bed with his 13-year-old son from a previous marriage. His rumored affair with Natalie Wood is also troubling because the child actress was only 16 years old. Furthermore, Dennis Hopper, who is in this movie and says he was having a fling with Natalie Wood too, is on record as saying all of this is true. How could these dark deeds not have influenced the movie’s creation or how we view it? Yet somehow out of all of this darkness comes a wonderful piece of cinema with a deep understanding of human nature and the flaws that so many of us share. 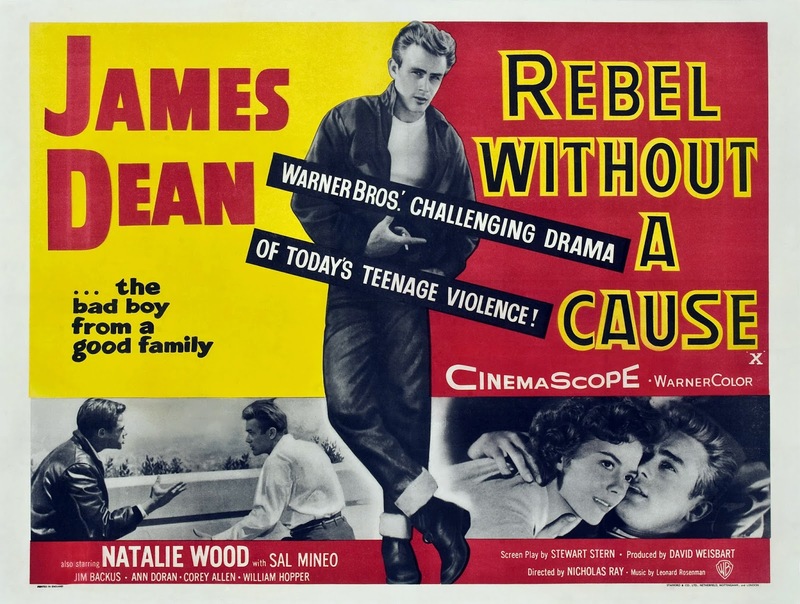 Rebel Without a Cause gives us teenagers with real problems that the adults are unconcerned with, and it gives us adults who are so self-absorbed in their own world that they can’t see beyond themselves to care about anyone else. 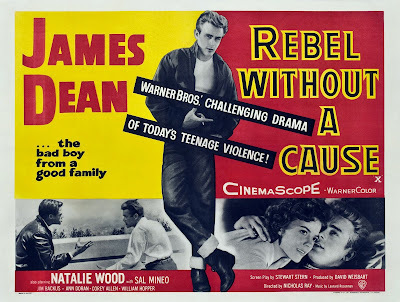 I firmly believe that we couldn’t have movies that realistically deal with teen problems if not for the ground broken by Rebel Without a Cause. We wouldn’t have The Graduate or even The Breakfast Club if Rebel Without a Cause hadn’t legitimized the pain and isolation that so many teenagers feel first. Surely this feels so authentic because there was so much genuine angst behind the camera. If you want to know what a real movie star is, watch James Dean. This was his second of three major films that he made before his death, and his performance in this movie is stunning, especially given his lack of experience. If you haven’t seen any James Dean movies and you only know him from pop culture, I don’t even know how to describe him to you. Take the looks of a very young Brad Pitt and combine that with the scowling, introverted darkness of Benicio del Toro and you have the beginnings of what it’s like to see James Dean in action. Some actors—FEW actors—have an effortlessness about them that make them impossible NOT to watch. They’re so magnetic in their movements and in their delivery that you’re transfixed. They don’t look like us. They don’t act like us. They are so distinctive that they should have a spotlight on them. Well, that’s James Dean and this is the movie that made him a household name. He’d co-starred in East of Eden earlier in 1955, but this is the movie, coming just days after his death, that cemented the legend. Equally, his co-stars are in fine form. Natalie Wood was in the process of making a conscious transition from child-star performances into more grown-up material, and she seems decades older than her sixteen years. The secret to an actor’s soul is their eyes, and Natalie Wood’s eyes seemed to be a thousand years old. Unfortunately, there were off-screen reasons for that faraway look. Equally impressive is the turn given by Sal Mineo as a classmate of Dean’s who is fed up with his status quo and looking for a way out. And if you only know Jim Backus from his comedic roles like Thurston Howell III on Gilligan’s Island, you’ll be surprised to see him portraying Dean’s ineffective father in a part that really gives him dramatic opportunity. Director Nicholas Ray had a good, maybe even great, career in movies, directing some legitimate classics beyond Rebel Without a Cause. He directed Bogart in 1950’s In a Lonely Place (I sense a theme) and is even the man we have to thank for bringing the feminist western Johnny Guitar to life in 1954. In 1961, he took a turn at the Big Hollywood Epic with his movie about the life of Jesus Christ with King of Kings. As you can see, this is a man with a resume full of quality stuff, but I think Rebel Without a Cause stands above all of these. I can’t really think of another movie to compare it to, even now. Ray directs with confidence and makes great use of his locations, turning one of LA’s most recognizable landmarks, Griffith Observatory, into something akin to Holy Ground for cinemaphiles. In contrast, he makes suburban California feel like a lonely, desolate place with walls that seem to be constantly closing in on its inhabitants. He plays with our sense of space, offering high shots to show power and low shots to convey powerlessness. He uses color to great effect, with both James Dean and Natalie Wood wearing red to stand out against everyone else. He also isn’t afraid to use Dutch angles to give us a sense of unease or dread. We shouldn’t be surprised; his cinematographer was Ernest Haller, the man who shot Gone with the Wind. Rebel Without a Cause is a dark movie about abandonment, angst, and murder with an origin mired in tragedy and controversy. It’s also a fantastic film that’s essential viewing for movie fans, offering a fresh look at teenage life in the mid-fifties in an honest light. Unlike the standard studio fare of the time, it presents no solutions or happy endings, just incredible storytelling from its writers, actors, and director. It’s a movie that will forever be remembered mainly for the death of its lead actor, who was gone before he even really got started, but who has never been forgotten. Thanks for the nice article Heath. I remember watching this in high school, on one of those glorious days where the teacher didn't feel like teaching and had us watch a movie instead (I think it was math class). BTW, do you know whether the East of Eden movie is worth seeking out? I really enjoyed the book as a teenager. East of Eden - it is, Paul! It's great and effective because James Dean was completely perfect for it. As much as I love it, it also has my least favorite role for a girl. I mean it makes me ANGRY. But that's just me. I would recommend ANYTHING with James Dean in it. He only had three starring roles, so they're all worth your time. Thanks, Heath! I've never seen it in its entirety. I think I'm worried it'll be a little claustrophobic, the way teenagers get locked in their own little worlds. James Dean was powerful. He could pull you any which way. BUT, I will see it, thank you! I think it's sitting on my tiny DVD shelf. It is claustrophobic, but it's worth it. To me, at least. The only thing I disliked about this movie is how they had Sal Mineos character be at the police station for killing a puppy at the beginning. It made me not care at all when he dies at the end.